The 2008/2009 art market ended seven years of astonishing price inflation. By the end of 2008, contemporary art suffered a price decline of 27.1 percent, followed by another 4 percent drop in the first half of 2009, according to ArtPrice's new report, Contemporary Art Market: The ArtPrice Annual Report. A change in auction-house strategy was fundamental to preventing the continuation of the plunge. From 2002 to 2008, speculation fueled profound growth in the contemporary art market. New auction records were the norm as prices climbed with unprecedented velocity. The high end of the market was particularly active, with the number of pieces selling for more than €1 million surging by 620 percent. Because of that bubble, the contemporary segment was the first to get slammed after the financial market downturn was accelerated by the collapse of Lehman Brothers. Before that point, contemporary art had resisted the effects of the subprime mortgage crisis. Much of the growth through 2008 was supported by the expansion of a worldwide super-high net worth demographic with a taste for contemporary art, particularly in Russia and the Middle East. Roman Abramovich, for example, had developed what will eventually be considered a legendary appetite, symbolized by his purchase of a Francis Bacon triptych for close to $90 million in May 2008. The market's rate of acceleration, especially with the emergence of the financial crisis, became unsustainable. At the end of the first quarter of 2009, the world had 300 fewer billionaires, and the impact on the contemporary art market was already evident. Galleries began to close, according to ArtPrice, and private sales fetched lower prices. Cash-starved collectors accepted much lower prices than they could have imagined taking a year earlier, while those who could afford to sit and wait withdrew their pieces from the market. Artists operating primarily in the private sale space changed their strategies – some willingly, some not. In Manhattan, I saw several artists look for alternative exhibition spaces, from homes to upscale gyms. Nelson Diaz took a more unorthodox approach, bringing his art into the public consciousness through an innovative street display. Artists accustomed to consistent private sales found the market dry. The smart ones (and those with the means to do so) effectively wrote off the 2008/2009 art year (July to June) and used the time to explore new styles, play with innovative exhibition ideas (e.g., Diaz) and develop bodies of work to have available upon the eventual upturn of the art market. For the auction houses, the situation was no different. 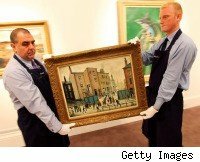 Establishments such as Christie's (CTG:UK) and Sotheby's (BID) were hit severely. In addition to enduring declines in revenue, consolidating categories and having to reduce their staffs, the auction houses had to change their basic operations. In October 2008, the rate of unsold lots surged from 33 percent to 47 percent, and for the fourth quarter of last year, guaranteed minimum prices left the houses with substantial prices to pay -- because bidders weren't biting. The auction houses did take measures to soften the blow. They almost completely abandoned the practice of guaranteeing minimum prices, lowered pre-sale estimates and cut reserve levels (by 10 percent in the case of Christie's). Departments were restructured, and branches were shuttered. And, they started selling cheaper artwork. With Picassos and Bacons not moving as easily as they had in the past (or at all, from time to time), the houses began to auction more lots with prices below €5,000. Though revenue from contemporary art auctions continued to slide, these measures reduced costs and kept collectors engaged. From the second half of 2008 to the first half of 2009, the rate of works left unsold fell 7 percent. The current art market slump, which has been compared to that of 1990-1992, has obliterated two years of appreciation ... which isn't as bad as it sounds. Prices remain 87 percent higher than those recorded in the 2005/2006 art year. Art collectors and investors have not had to surrender all their growth. Those who entered the market before 2005 and relied on a buy-and-hold strategy have generally come out ahead. When you look at the market today, pricing isn't the most vexing problem. Rather, liquidity is the most pressing concern. Many collectors, fearful of not being able to attain desired sale prices, at auction or in private, have withheld their inventory. Those who were willing to roll the dice were sometimes turned away by auction houses that weren't ready to assume the risk to their reputations of not being able to sell high-profile pieces. It isn't possible to factor these dynamics into the year's performance, but it is safe to assume that declines would be worse if the effect of these "zeroes" could be included in the calculations. Stagnation appears to be the forecast for the balance of 2009. Some artists and collectors have been able to pierce the market's gloom, but the results continue to lag those of the art market boom. With the collapse of the art market now a year behind us, though, appearance will change substantially. In the beginning, performance was measured relative to pre-sale auction estimates, with the results falling far short of the marks set. When the pre-sale bar was set lower -- to alleviate a perception problem -- market-watchers could still look to the previous year's sales to gauge the distance the art market had fallen. Now, that benchmark is no longer available, since we're looking at performance relative to a year of miserable auction results. For art collectors, the perspective will have to shift to a multiyear view. Obviously, individual buyers will compare current values to their entry points to ascertain appreciation relative to initial investment. The broader performance of the market, however, will have to look back on several milestones, including year-over-year, decline since the bust, and change from points in time such as 2006 (pre-peak) and 1999 and 2004 (to show the 10- and five-year developments). New collectors can take advantage of 2009 and 2010 to enter the market at the bottom, with the hopes that an eventual rally (we've seen them before) will push contemporary art prices through the roof again. Veteran collectors can use new acquisitions to offset the losses (or lost appreciation) on pieces already in their collections. These forays back into the auction houses and galleries will solve the liquidity problem, which is the first step in an art market recovery. Bigger auctions with more lots will eventually follow, and excitement will return. Having learned the lessons of the 2008/2009 art market recession, collectors will doubtless exercise far more caution than they did in 2006 and 2007, making smart purchases based on both personal taste and investment potential ... just kidding. At some point, everyone will go nuts again. It's bound to happen.